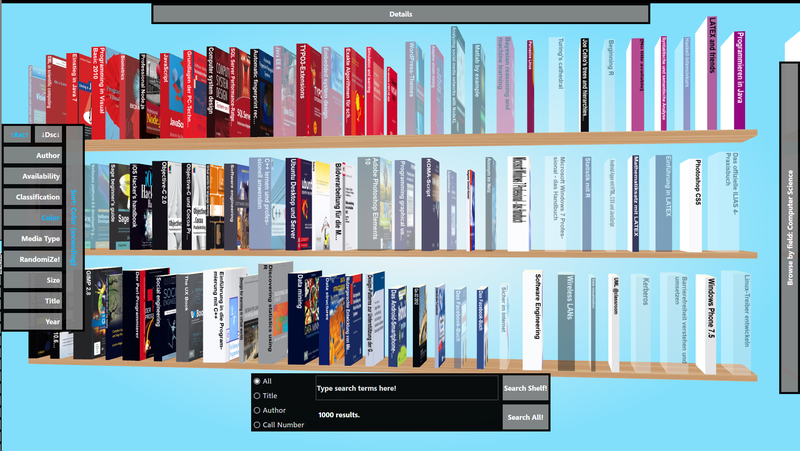 As a preparation for my talk at the Bibliothekartag I made a short video of the HTML5 version of the Blended Shelf. 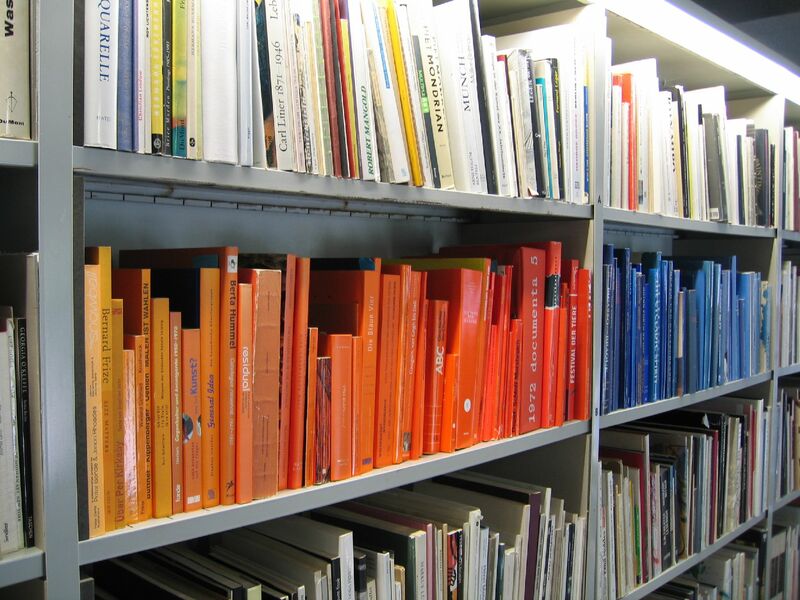 I am happy to announce that I will talk about the Blended Shelf at the Bibliothekartag 2014 in Bremen. The talk will be embedded in the awards ceremony of the B.I.T.online – Innovationspreis. The session is planned for the 05. June 2014 from 10:30 to 12:30 at the Stand der Verbände. The talk will be a follow-up to my talk last year in Leipzig. While in Leipzig I had to conclude my talk with assumptions about the usability and usefulness, I now will be able to present the results of my studies and give an insight in the current efforts to develop it further. I am looking forward to interesting talks and an inspiring conference! Ohio.com (Akron Beacon Journal Online) and VÖBBLOG are writing about “shelfies“. That is the term for the shelf-equivalent of “selfies” (Wikipedia: Selfie). I didn’t know that the New York Public Library already called out a #libraryshelfie day on 29. January 2014. I will start to share my favorite shelfies in a gallery. While writing my master thesis about an digital but reality-based interface to library collections (Blended Shelf), I did an extensive research of related work. In the following posts I give an quick overview over products, concepts and prototypes which somehow integrate shelves into their user interface. The lists are not final and I sure have missed some approaches, so I’ll update the posts if I’ll stumble upon other interfaces. If you know about shelf-related interfaces which are not listed here, please let me know by contacting me or simply leave a comment. Commercial: This categorie assembles applications and interfaces which were or still are commercially available for end users or institutions other than libraries. Scientific: For items in this categoriy libraries are only a use case to explore some concepts. Mostly the prototypes where not actually used in libraries except for research studies. Library-specific: Here I collect all approaches which focus on serving libraries and their users. This products could be the result of commercial development, library in-house development or of scientific approaches. Today I start the series with the commercial products. Posts about the library-specific and scientific approaches will follow soon. finally I realized my long pursued wish for (re)setting up my personal weblog. 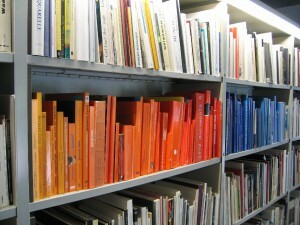 Blended Shelf showing a color sorted shelf. I’m trying my best to blog regularly on interesting stuff and innovations regarding libraries, technology and especially the intersection of both. 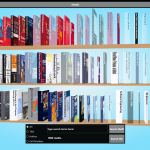 As a start I will set up a website with information about the Blended Shelf which is a result of my master thesis. Additionally you can keep track via my blog about the current and ongoing developments of this reality-based approach of library collection exploration and presentation. You are welcome to browse through the pages and get an impression about my work and interests in library-, information and computer science. If you have any questions or feedback, feel free to contact me or leave a comment.